Gold Purity : 14k (58.5%) Pure Hallmarked Gold. Gold Purity Availability : 18k (75%) Pure Hallmarked Gold. About Round Diamond. Total Diamond ctw : 1.56ctw. Total Diamond Color : I/J. Total Diamond Clarity : SI1. HIGH END ART DECO 1.65 CT. DIAMOND HANDMADE WEDDING BAND RING 14K WHITE GOLD SIZE US7. 14K White Gold Diamond Drop Dangling Chandelier Earrings. Butterfly back. No fakes, no lie, no hassle. 14k white gold earrings weigh together 8.8g. Diamond color H clarity SI1. 56 diamonds, total weight is 1.50ct. Color / ClarityG / SI1 Side Diamonds. G / SI1 Center Diamonds. Imperial and elegant. These solid 14k rose and white gold earrings are created in a Victorian inspired, old Russian style design. 18 beautiful diamonds totaling 1.60ct. are set into masterfully crafted rose gold. Gold Purity : 14k (58.5%) Pure Hallmarked Gold. About Total Diamond. Total Diamond ctw : 1.15ctw. Total Diamond Color : I/j. Total Diamond Clarity : SI2. Total Diamond Shape : Round. Gold Color : Yellow. 14K YELLOW GOLD. 14K Solid Yellow Gold. 4 DIFFERENT WAYS TO WEAR EARRINGS. ROUND DIAMOND. We will work with you and will try to accommodate any your requests and wishes. Mouse over images to see larger version. 14k White Gold & Diamond Dangle Earrings w/ Pave Ribbons & Prong Flower Clusters. This beautiful pair of ribbon and flower dangle earrings is crafted in solid 14k white gold and features 88 round brilliant cut diamonds. Each 18k white & yellow 2-tone gold earring features sparkling princess-cut diamonds set in 2 curved 18k white gold squares, surrounded by round-diamond studded 18k yellow gold square halos & connected by 5 round-diamond studded 18k white & yellow gold round links. Indian Ethnic Necklace. Pave Diamond Bangle. Polki Diamond Bangle. Diamond Wedding Bangle. Rose Cut Diamond Bead. Pave Diamond Bead Ball. Wide Cuff Bangle. Pave Diamond Jewelry. Russian Vintage Style Genuine Diamond Earring Solid 14k Rose & White Gold E1072. Russian Jewelry 14k Rose & White Gold Diamond Earrings. Imperial and elegant. These solid 14k rose gold earrings are created in a old Russian design. Sturdy french leverback locks provide a secure fit. We can make any jewelry in14K Gold ,18K Gold or950 Platinum and in all colors and color combinations. All of our jewelry issolid gold. Nothing Less than the karat weight as advertised! 14K Solid Yellow Gold. Earrings In A Solid 14K White Gold With Push back. Total Diamond Weight : 1.68 Ct. Diamond Color : G/H. This Diamond Earring is an absolute beauty and looks stunning. Diamonds Shape : Round. If for any reason this does not live up to your expectations. These are Fine Round Diamond Cluster Drop/Dangle Lady's Earrings. They have a CTW of 1.59Ct and weighs 5.9 grams. The diamonds have a SI1 clarity and F color. Here we see a beautiful pair of dangle drop earrings with brilliant round cut white diamonds that form a curved cluster design. Material: 10K Yellow Gold. Gemstone Color: Chocolate Brown/I-J. Gemstone: Topaz 4. Length: 33 mm. Closure: Butterfly. Style: Hoop Dangle. Gemstone Shape: Teardrop & Round. 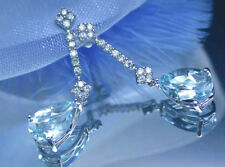 SK Bridal Jewels-. Gold Purity : 14k. ©SK Bridal Jewels. About Total Diamond. Total Diamond ctw : 1.60ctw. Total Diamond Color : I/J. Total Diamond Clarity : SI1. Total Diamond Shape : Round. Gold Purity : 14k (58.5%) Pure Hallmarked Gold. About Total Diamond. Total Diamond ctw : 1.50ctw. Total Diamond Color : I/J. Total Diamond Clarity :SI2. Total Diamond Shape : Round. Total Diamond Cut : Brilliant Cut. ITEM #: R6015. 14Karat Yellow and White Gold Halo Diamond Earrings. FLUORESCENCE: FAINT. Here is a sweet pair of yellow dangle diamond halo earrings. 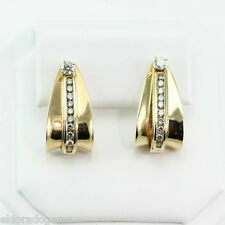 1.11cts Natural Light Yellow Cushion Cut Diamond Dangle Earrings. Details: Set in 14K yellow gold, this item has 1.61 carats of round diamonds. Diamonds are SI-1 in clarity and H in color. Combined weight is 8.3 grams. SKU# EG191. With Filigree. Heart-shaped Diamond Filigree DangleEarrings. in 18k White Gold. Heart Diamond Drop Earrings. 1.50 ct of Round Brilliant Cut Diamonds. Earrings weigh 6.6 grams. VS-SI1 clarity, H color. These are Fine Square Cluster Diamond Drop Dangle Earrings. They have a CTW of 1.50Ct and weighs 6.4 grams. The diamonds have a SI1 clarity and F color. Here we see a beautiful pair of dangle drop earrings with brilliant round cut white diamonds that form a square cluster pattern. These are Fine Fancy Color Round Diamond Cluster Black Huggie Earrings. They have a CTW of 1.74Ct and weigh 7.5 grams. The diamonds have a SI1 clarity and are fancy color & G color.Here we see a beautiful pair of hoop earrings with brilliant round cut fancy color diamonds that form a cluster pattern with brilliant diamond accents surrounding it. Gold Purity : 14k (58.5%) Pure Hallmarked Gold. About Total Diamond. Total Diamond ctw : 1.50ctw. Total Diamond Color : I/J. Total Diamond Clarity : SI1. Total Diamond Shape : Round. 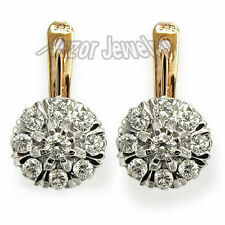 These are Fine Round Diamond Cluster Drop Dangle Stud Lady's Earrings. They have a CTW of 1.70Ct and weighs 7.1 grams. The diamonds have a SI1 clarity and F color. Here we see a beautiful pair of drop stud earrings with brilliant round cut white diamonds that form a round shape cluster design. Gold Purity : 14k (58.5%) Pure Hallmarked Gold. Total Diamond Shape : Round. Total Diamond Color : I/J. About Total Diamond. Total Diamond ctw : 1.60ctw. Total Diamond Clarity : SI1. Gold Color : Yellow. Gold Purity : 14k (58.5%) Pure Hallmarked Gold. Total Diamond Shape : Round. Gold Purity Availability : 18k (75%) Pure Hallmarked Gold. About Round Diamond. Total Diamond Cut : Brilliant Cut. Total Diamond Color : I/J. These are Fine Round Diamond Cluster Drop/Dangle Lady's Earrings. They have a CTW of 1.50Ct and weighs 4.1 grams. The diamonds have a SI1 clarity and F color. Here we see a beautiful pair of dangle drop earrings with brilliant round cut white diamonds that form a cluster. 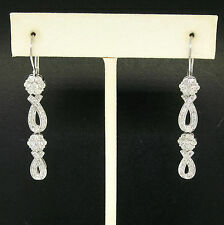 These are Fine Round Diamond Cluster Drop/Dangle Spiral Lady's Earrings. They have a CTW of 1.62Ct and weighs 14.4 grams. The diamonds have a SI1 clarity and F color. Here we see a beautiful pair of dangle drop earrings with brilliant round cut white diamonds that form a oval spiral shape cluster design. Perfect Gift For All Occasions ! Dangle Earrings. Natural Diamonds & Natural 0.40 Cts Ruby. 1 Pair Earrings, 1 Authenticity Certificate. Natural/Synthetic Diamonds. Natural Diamonds. •Custom Jewelery Designing - We Can Manufacture Your Jewelery Design. THIS IS A BEAUTIFUL DIAMOND & PEARL DANGLE EARRING. 2 PAIRS OF OVAL SHAPE 5MM FRESH WATER WHITE PEARL. LENGTH OF THE EARRING IS 1 1/4" LONG. TUBE BEZEL SETTING DIAMONDS. 14K SOLID YELLOW GOLD. GENUINE NATURAL ROUND DIAMOND. SK Bridal Jewels-. Stone : Ruby(Lab Created). ©SK Bridal Jewels. About Total Diamond. Total Diamond ctw : 1.60ctw. Total Diamond Color : I/J. Total Diamond Clarity : SI1. Total Diamond Shape : Round. Gold Purity : 14k (58.5%) Pure Hallmarked Gold. About Total Diamond. Total Diamond ctw : 1.04cts. Total Diamond Color : I/J. Total Diamond Clarity : SI1. Total Diamond Shape : Round. Total Diamond Cut : Brilliant Cut. These are Fine Flower Star Round Cut Diamond Cluster Drop Earrings. They have a CTW of 1.54Ct and weighs 4.3 grams. The diamonds have SI1 clarity and F color. Here we see a beautiful pair of dangle drop earrings with brilliant round cut white diamonds that form a flower star shape cluster style. Indian Ethnic Necklace. Elegance and versatility flourish in these striking very stylish Jewelry. Rose Cut Diamond Bead. Fusion Gold Earrings. Diamond Clasp and Lock. Diamond Feather Jewelry. Diamond Palm Bracelet. Details: Set in 14K white gold, this item has. 47 carats of round diamonds. Diamonds are SI-1 in clarity and H in color. Sapphires weigh a total of 1.12 carats. Combined weight is 3.6 grams. SKU# E13046. (Main Stone: Diamond. Carat Weight: 1.55 CT. Shape: Round. Never enhanced, or lab treated. All of our gold is 100% 14K or 18K SOLID gold. Nothing less. Very competitive wholesale prices. c) No middleman. Details: Set in 14K white gold, this item has 1.61 carats of diamonds (.51c round accent diamonds & 1.10c combined round center stones) Diamonds are SI-1 in clarity and H in color. Combined weight is 2 grams. HALLMARKS : 18K LO. LOT#SONUER/158-WY/08250. DIAMONDS : 1.58 CARAT TOTAL WEIGHT AVERAGE COLOR H AND SI1 CLARITY.